If you have enough credits, that is. It will check to see if you have enough, and if so, if you are at a class A or B starport, you will get prompted for refined or unrefined. Otherwise it defaults to unrefined. 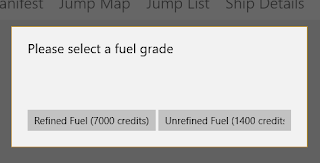 It will then top you off (class fuel capacity - what you have left in your tanks) and reduce your credits appropriately. I could put in an option for wilderness refueling, but you can go to the ship editor and just set the fuel to what you need (and I probably should add some validation to data entry).